Review The original Samsung Wave came out last year to general approval as a cut-price smartphone running on the company’s new Bada operating system – a curious development given Samsung’s own endorsement of Android. However, Bada was always intended to offer smartphone functionality for a lower cost. Samsung’s Wave II features the same OS, but with a bigger and better screen plus an improved camera and video editing capabilities to boot. 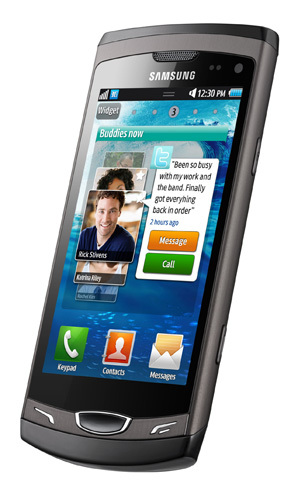 The Wave family includes the smaller Wave 723 with its 3.2in screen, less memory and no HD video, and the even lowlier 523. At the crest of these Waves, this latest incarnation os noticeably bigger than its predecessor at 124 x 6 x 12mm and 135g (the original was 118 x 56 x 11mm and 118g) with a screen boosted from 3.3in to 3.7in. The menu button is also now bigger and easier to find. On top of Samsung’s Bada OS sits the company’s TouchWiz 3.0 user interface, which features up to ten screens which you can populate with various widgets, Android style. Samsung’s widgets have been steadily evolving, and among the various news and stocks updates, calendar and search options, there’s now a Feeds and Updates widget, which shows a scrolling list of networking updates. There are also a couple of thousand apps available from the Samsung Apps store, including ebook readers. Social networking is fairly well integrated throughout, with the Social Hub, which pulls together your social networking updates along with emails and text messages. 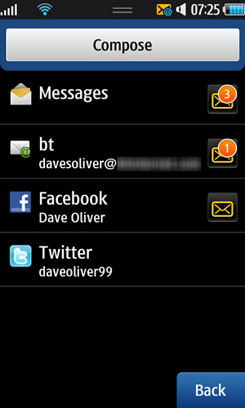 It tells you how many notifications you have for each app, which is handy, but you’ll need to open each separately to view them. 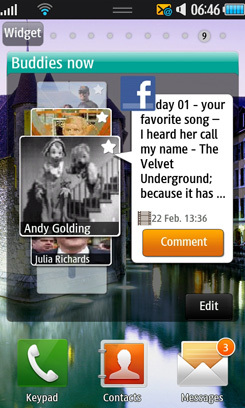 You can also sync your Facebook and Twitter contacts and calendar easily and link your favourites to a ‘Buddies now’ widget. The virtual keyboard is spacious and easy to use with handy keys for @ and .com up front. The Quicktype feature remains, that allows you to type without taking your finger off the keyboard, and works okay once you get used to it. The browser does a good job of rendering pages and it’s intuitive to use, though like Nokia’s Symbian handsets the controls have taken a bit of a slap with the ugly stick – not quite as hard though.